The AALL Executive Board receives recommendations from the AALL Special Committee on National Information Policy to develop an organizational structure through which AALL can effectively track and respond to information policy issues, including creating a presence for the Association in Washington, DC. In response, the Executive Board approves restructuring the existing Legislation and Legal Developments Committee into the Government Relations Committee and the appointment of AALL members Robert L. Oakley of Georgetown University Law Library and Joanne Zich of American University Washington College of Law Library as the first Washington representatives for the Association. The AALL Executive Board approves the final recommendations of the AALL Special Committee on National Information Policy, adopting a Government Relations Policy that is published in Law Library Journal along with the final report. 83 Law Libr. J 177-194 (1991). Upon recommendation of the Special Committee, the first annual AALL legislative update is held at the AALL Annual Meeting in Minneapolis (June 18-20). This program continues to be held each year by the government relations staff and AALL’s policy committees. AALL lobbies Congress on a legislative effort to develop a national information policy. While ultimately unsuccessful, the effort raised the Association’s profile and helped AALL gain a seat at the table to work with the Office of Management and Budget to update Circular A-130, “Management of Federal Information Resources.” The updated circular explicitly states the public’s right of access to government information. AALL applauds the enactment of the Government Printing Office Electronic Information Access Enhancement Act of 1993 (P.L. 103-40). Also known as the GPO Access Act, the new law establishes a means for providing the public with online access to electronic federal government information. Under the law, GPO launches GPOAccess, which was the basis for today’s govinfo system. The AALL Executive Board adopts an “AALL Preservation Policy” that directs the Association to raise advocacy efforts for greater permanent public access to government information, legal records, and history. AALL National Conference on Legal Information Issues brings many leaders in the legal, publishing, and government professions to the AALL Annual Meeting in Pittsburgh (July 15–20). AALL publishes, with Fred B. Rothman Co., The National Conference on Legal Information Issues: Selected Essays in 1996, to focus on issues raised by speakers at the National Conference. Working with other library associations, AALL advocates for language in the reauthorization of the Paperwork Reduction Act to improve the quality and use of federal information and strengthen requirements for the dissemination of public information. These provisions were enacted into law (P.L. 104-13). AALL successfully opposes efforts to downsize and privatize the Government Publishing Office (GPO, then the Government Printing Office). AALL establishes a formal working group of the major library associations—the Inter-Association Working Group on Government Information Policy—to collaborate on issues related to the GPO and the Federal Depository Library Program. AALL participates in an advisory capacity to the GPO study group on the Future of the Federal Depository Library Program. AALL helps ensure that all three branches of government participate and coordinates the library community response. 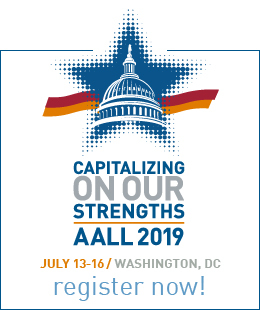 AALL holds its second National Conference on Legal Information Issues as a part of its AALL Annual Meeting in Washington, DC (July 17-22). The first AALL Legislative Day brings 50 members together to learn about AALL’s legislative priorities and how to advocate, followed by visits with their representatives on Capitol Hill. AALL publishes the AALL Universal Citation Guide—a product of the Committee on Citation Formats—with assistance from the Wisconsin State Bar. It contains recommendations for universal citation rules covering judicial decisions, statutes, and administrative regulations. The AALL Universal Citation Guide, now in its third edition, is published and distributed by William S. Hein & Co., Inc. AALL uses the Guide to advocate for adoption of a vendor-neutral citation system. AALL speaks out in opposition to the approval of the Uniform Computer Information Transactions Act (UCITA) by the National Conference of Commissioners on Uniform State Laws (NCCUSL, later renamed the Uniform Law Commission). Working with the 4CITE/Americans for Free Electronic Commerce Transactions coalition, AALL helps limit enactments to only two states. NCCUSL pulls its support for UCITA in 2003. AALL strongly opposes passage of the USA PATRIOT Act that expands government surveillance, threatening the privacy and confidentiality of library users and suppressing the free and open exchange of ideas and information. Despite strong opposition from the library community and civil rights and privacy advocates, President George W. Bush signed the USA PATRIOT Act (P.L. 107-56) in October. AALL and Georgetown Law Library host the Preserving Legal Information for the 21st Century: Toward a National Agenda conference. 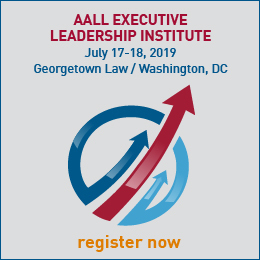 AALL becomes a founding member of the Open the Government coalition that pushes back on expanding federal government secrecy and the widespread takedown of information from government websites in the wake of the September 11, 2001, terrorist attacks. AALL President Janis L. Johnston testifies before Congress at the House Committee on Administration’s oversight hearing on the GPO on behalf of AALL. She asks members of Congress to reaffirm the core principle that the American public has the right to no-fee access to government information. She also reiterates the library community’s belief that the Federal Depository Library Program and depository libraries will continue to provide crucial access and service points for the public in the 21st century. Oakley is appointed as a member of the U.S. Copyright Office’s Section 108 Study Group. The goal of the group—named after the section of the U.S. Copyright Act that provides limited exceptions for libraries and archives—is to make recommendations to the Librarian of Congress on possible changes to the Section 108 of Title 17 that exempts libraries and archives to make and distribute copies of works. The Executive Board endorses a “Resolution on No-Fee FDLP Access To PACER” to support greater library access to the Public Access to Court Electronic Records (PACER) system. AALL raises concerns about the closure of the U.S. Environmental Protection Agency (EPA) libraries. Congress later orders the EPA to reopen the three regional libraries and EPA Chemical Library in Washington, DC, and to restore public access to the EPA Headquarters Library. AALL convenes a National Summit on Authentic Legal Information in the Digital Age. Approximately 50 delegates participate, including judges, state government officials, attorneys, and leaders of AALL and of other organizations such as the American Bar Association. Delegates discuss policy and technological solutions to address the authenticity and official status of state-level primary legal sources. The Executive Board adopts a set of “Principles and Core Values Concerning Public Information on Government Web Sites” developed by the AALL Access to Electronic Legal Information Committee. The Principles are used to advocate for permanent public access to authentic government information. The Executive Board approves the name change of the AALL’s Washington Affairs Office to the Government Relations Office. The Executive Board approves the recommendation of the Government Relations Committee to establish a new annual award designed to recognize a member who has contributed significantly to AALL’s policy agenda at the federal, state, local, or international level. Oakley was posthumously named the recipient of the Member Advocacy Award at the AALL Annual Meeting in Portland, Oregon (July 12–15), and the award is renamed in his honor. The Uniform Law Commission forms a Study Committee on Online Authentication of Legal Materials to investigate the issues raised at AALL’s National Summit and discuss the feasibility of creating a uniform law or model act. Minnesota Revisor of Statutes Michele Timmons, a delegate at the National Summit in 2007, is named chair, and former AALL President Barbara A. Bintliff serves as AALL’s observer. President Bush signs the AALL-supported Openness Promotes Effectiveness in our National (OPEN) Government Act of 2007 (P.L. 110-175) that includes several key reforms to the Freedom of Information Act (FOIA). In response to the AALL “Resolution on No-Fee FDLP Access to PACER,” the GPO and the Administrative Office of the U.S. Courts announce a new pilot project in November that allows users of 17 federal depository libraries to access PACER at no fee. Eighty AALL members participate in the AALL Day on the Hill, meeting with their members of Congress and their staffs on AALL’s legislative priorities. During the Uniform Law Commission’s annual conference, the ULC Executive Committee unanimously approves the Study Committee’s recommendation to create a Drafting Committee on Authentication and Preservation of Electronic State Legal Materials. Timmons is named chair of the Drafting Committee, Bintliff is the reporter, and former AALL Government Relations Committee Chair Keith Ann Stiverson is AALL’s observer. AALL puts out a call for volunteers for state working groups that will take action to promote access to official, authentic legal information. The working groups, made up of hundreds of volunteers, lead the ambitious effort of contributing to the groundbreaking National Inventory of Legal Materials. The information is used to update AALL’s state-by-state reports and supported AALL’s State Online Legal Information website. The website provides status information about no-fee online access to primary legal materials. The Uniform Law Commission approves the Uniform Electronic Legal Material Act (UELMA) during its annual meeting in Vail, Colorado. The act requires that when legal material is published in an electronic format only, the material must be designated as official. It also mandates that official electronic legal material be authenticated, preserved, and made permanently accessible to the public. In April 2012, Colorado becomes the first state to enact UELMA. For her service as the reporter for the UELMA drafting committee, Barbara Bintliff is presented with the 2012 Robert L. Oakley Advocacy Award at the AALL Annual Meeting in Boston, Massachusetts (July 21–24). AALL joins the GPO and the Administrative Office of the U.S. Courts to launch a new pilot project—the PACER Access and Education Program—to increase access to PACER. AALL joins the Owners’ Rights Initiative, a coalition that supports the principle that “if you bought it, you own it.” AALL signs on to an amicus brief to support petitioner Supap Kirtsaeng in Kirtsaeng v. John Wiley & Sons, Inc., and AALL is pleased with Supreme Court’s decision in favor of the first sale doctrine. AALL hosts its inaugural Local Advocate Lobby Day that brings together AALL members and chapter members to advocate for the Association’s legislative priorities on Capitol Hill. The Lobby Day runs annually through 2015. AALL celebrates the Federal Communications Commission’s (FCC) adoption of net neutrality rules. Under the new Open Internet Order (80 FR 19737 [04/13/2015]), internet service providers are prohibited from blocking or slowing down web traffic, or speeding it up, in exchange for money. AALL applauds the enactment of the USA FREEDOM Act (P.L. 114-23) that ends the bulk collection of Americans’ phone records. Under the legislation, all significant constructions or interpretations of law by the Foreign Intelligence Surveillance Act court must be made public. Boston University School of Law (BU Law) and AALL host the National Conference on Copyright of State Legal Materials, a day-long event held at BU Law. The conference brings together legal information professionals, policymakers, and copyright experts to explore policy and practical issues related to copyrighted state legal materials and to discuss solutions to ensure more state legal information is in the public domain. AALL celebrates passage of the FOIA Improvement Act (P.L. 114-185) that codifies a presumption of openness, improves public access to released records, and streamlines the request process. AALL urges the Senate to approve the nomination of Carla D. Hayden as Librarian of Congress. AALL celebrates Dr. Hayden’s confirmation and the AALL president, executive director, and director of government relations attend her swearing in ceremony at the Library of Congress. The House Committee on House Administration includes AALL as a key stakeholder in its review of Title 44 of the U.S. Code, Public Printing and Documents. The result of the Committee’s year-long review is the introduction of the FDLP Modernization Act of 2018 (H.R. 5305), which AALL strongly supports. During its review, AALL members Mary Elizabeth (Beth) Williams and Stephen Parks testify before the Committee. AALL celebrates language in the Fiscal Year 2018 omnibus appropriations act (P.L. 115-141) that requires the Library of Congress publish all non-confidential Congressional Research Service (CRS) reports on a publicly accessible website. Access to CRS reports was an AALL policy priority for more than two decades. AALL President Greg Lambert testifies before the House of Representatives Legislative Branch Appropriations Subcommittee in support of the agencies’ requested Fiscal Year 2019 funding for the GPO and Library of Congress/Law Library of Congress. The GPO receives full funding for Fiscal Year 2019 and the Library of Congress receives a funding increase over prior years that benefits the Law Library. AALL applauds the enactment of the Open, Public, Electronic and Necessary (OPEN) Government Data Act (P.L. 115-435) that requires all non-sensitive government data to be made available in open and machine-readable formats by default. As of January, UELMA has been enacted by 19 states and the District of Columbia, with several more introductions expected this year.